Copy the web address in the story: Right click in the address box at the top of your screen and select "copy" from the link. 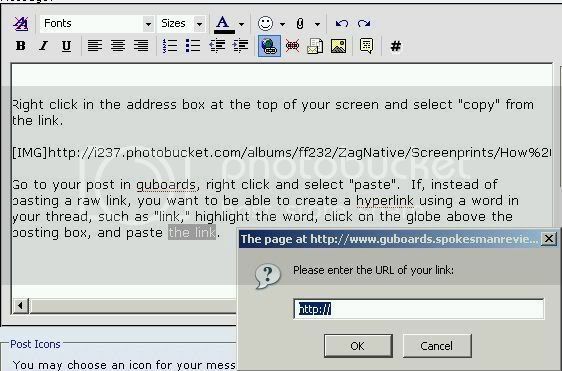 Paste the web address of the story in your post: Go to your post in guboards, right click and select "paste". If, instead of pasting a raw link, you want to be able to create a hyperlink using a word in your thread, such as "link," highlight the word, click on the globe above the posting box below the smiley face, and press Control +V to paste the link. Note: If you don't see the address bar in step one from which to copy the address, go to "View" on the top menubar, look at "Toolbars," and make sure the "Navigation Bar" is checked.